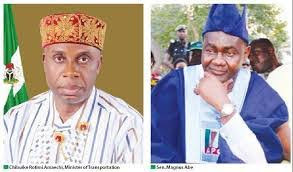 The All Progressives Congress senator representing Rivers South East constituency, Magnus Abe, has claimed the Minister of Transportation and Director General of the Buhari Campaign Organisation, Rotimi Amaechi, humiliated him by telling him not to contest in the presence of his wife. The Interview magazine reports that Abe said Amechi’s actions may hurt the party badly in the forthcoming elections. He also accused Amaechi of running a one-man show.